Classic metal sounds with some epic screams right from the start that takes you back to the golden era of great metal. I love old school metal and these guys have put together 6 tracks of old school glory. Big smash-your-face-in riffs with noodling, underlying leads soaring and diving into heavy metal heaven. Unique, but non abrasive, vocals are another element that cannot be missed. “Battle scars”, the first track, gives you a perfect indication of what you’re going to get and I would say would capture a whole range of fans. This is an EP that is full of songs of fighting and war; this should call the beast out of any man with their songs of death, destruction, honour and, of course, Valhalla. There is one song in there which appears to be the tale of the Titanic “Voyage of the Damned”. To be honest, I found myself quite surprised to find it a good song and catchy; who knew the Titanic and metal music could be a match. 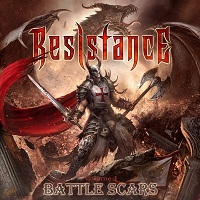 RESISTANCE have released 3 albums to date and have decided to try a new strategy and release EP’s rather than full albums, and this is Volume 1 in this new format and is a fantastic start of a new era for this band. If you love your old school metal, check out this release; you won’t be disappointed.